Domino's style sense knows no bounds! 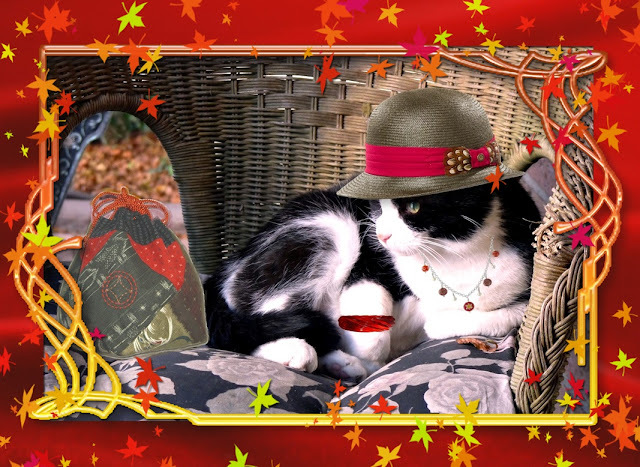 Here she is in a brown straw cloche hat with red band decorated with rust-coloured feathers. Her silver necklace is 'charming' indeed adorned with both plain and patterned red-glass beads; the red bracelet is an acrylic creation. Once again she has made an unusual choice for her handbag which is a rucksack-style patchwork in grays, browns and reds. It 'ties' everything together, don't you think? 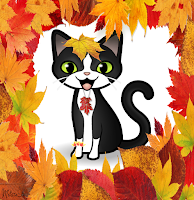 If you don't have fashion sense, but want to make sense out of fashion, just 'leaf' it up to Domino to show you the way. You look very regal in that on pretty Domino! You sure are styling, Domino! Very pretty, great choice for a purse.